grip on reality. The solution - head for the desert! There are many great side trips from Vegas but, without a doubt, a two-day circuit through Death Valley is one of the most unforgettable. If your idea of Death Valley is one of a vast nothingness baking in the shimmering heat, then you are in for a big surprise. Death Valley does hold the record as the hottest place in the United States, and it is the lowest point in the Western Hemisphere; but, it is also a place where it often snows and there are some very high peaks. Contrary to the dire sounding name, Death Valley is a thriving ecosystem that is home to more than 900 species of plants, a wide variety of wildlife and many unique, natural and man-made wonders. It is a place that exemplifies the quintessence of America's frontier spirit of survival. Set aside your preconceptions, open your mind to the subtle beauty inherent in desert terrain and prepare yourself for an unforgettable adventure. of adventure. Head south out of Las Vegas on Interstate 15; at the Route160 intersection turn west, and let the adventure begin. Recreation Area, a beautiful and diverse area, is a wondrous day-trip unto itself. complete record of the Earth's geologic past. 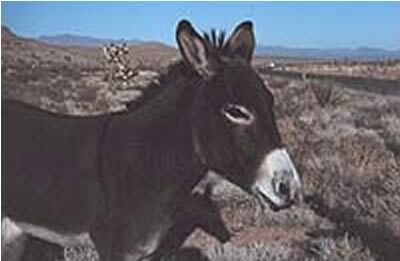 Be on the lookout for wild burros. They are descendants of those that got away from early pioneers. Because they do well in a desert habitat, the burros carved out aniche in Death Valley. The Wild Horse and Burro Act of 1971 protects them; however, they compete with the bighorns and other native species, foul water sources, overgraze and trample the undergrowth. To protect the fragile desert ecosystem, the Bureau of Land Management controls the population by capturing some and offering them for adoption. leaves to make cloth and sandals. 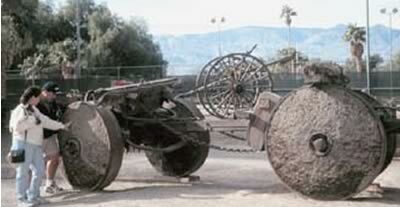 During World War II, this plant was used in the manufacture of burlap. This stretch of road could be termed "The Way of Lost Hope and Forgotten Dreams," for it roughly follows the Old Spanish Trail forged by Spanish explorers in 1830. A decade later it was an important route between Mormon settlements in Utah and California. rises to an elevation of 5,493 feet. The cottonwoods, juniper trees and pinyon pines in Mountain Spring Pass were evidence to the early travelers that here was a source of water. The white, powdery film on the juniper berries is the yeast that is essential in the making of sourdough bread, a staple of the early miners. The nuts of the pinyon pines were an important food source for Native Americans. Eighteen miles later turn west toward Tecopa; about 5 miles down the road, make the turn for Cathedral Canyon. A short distance down this side road is one-man's way of coping with his young daughter's untimely death. Rolland Wiley spent more than $1 million turning this mud wash into one of Death Valley's more incongruous sites. Dedicated to peace and harmony among all of God's creatures, the half-mile meandering canyon is decorated with famous quotes, stained glass, waterfalls, pictures, benches and statuary. In the quiet of the desert, one can feel the depth of his loss. Wiley died in 1994, so the area is in dire need of refurbishing. like huge bushes because the trunk and lower portions of these trees have been buried by wind-blown sand leaving only the tips of the branches visible. About 15 miles past the California border, the highway crosses the Nopah Mountains at Emigrant Pass. Park the car, walk about 300 yards to the ridge and look back at the valley to see the ruts carved into the floor of the desert by hundreds of pioneer wagons more than 150 years ago. By the time the pioneers had reached this point, their initial enthusiasm had waned; many questioned the wisdom of the adventure, others prayed to just survive. Another 10 miles down the road, take the turnoff to discover anotherone of the desert's little secrets. China Ranch is a working family farm set in a lush piece of greenery amidst the forbidding Mojave Desert -- a classic desert fantasy. 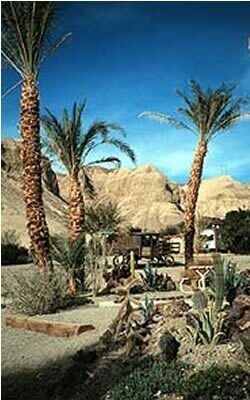 The Old Spanish Trail is within easy walking distance, as is the historic Tonopah & Tidewater Railroad. 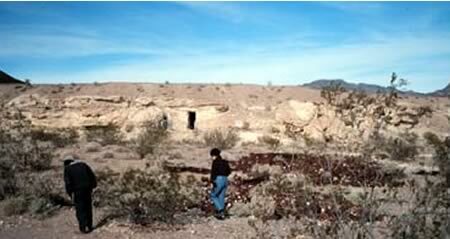 Visitors can hike to nearby old mines, or take an interpretive guided nature walk (make reservations at 760 852 4415). 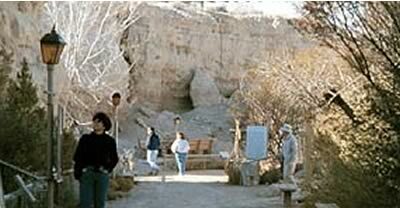 You'll learn about geology, botany, birds, early man in the area, the Old Spanish Trail and much more. The ranch's gift shop sells a variety of items including packaged dates, date shakes, date-nut bread, jams, post cards and unique hand crafted gifts. This detour takes between 45 minutes and two hours. about 10 miles to the intersection of Highways 178 and 127 at the townof Shoshone. Near the intersection, the dirt road to the left will take you about a quarter a mile to the Cave Houses. In the early part of the century, settlers and prospectors carved their homes into the soft sediment. The stillness belies the beehive of activity that once encompassed the area. Back on the highway, two miles down the road, turn left onto Highway 178; 5 miles later you will officially be in Death Valley National Park. Eighteen miles down the road is a photo opportunity. Look for Skull Rock on the left. Use your imagination! indicating the elevation is compulsory! A salt-crusted pool of water containing four to five times the salt content of the ocean, Badwater is 282 feet below sea level. Only by gazing up at the sign high on the side of the mountain that reads "sea level" can one truly comprehend the depth. Even here plants such as the Desert Holly and Pickleweed thrive. Badwater never dries out completely, and even manages to support a unique species of fish - the Death Valley Pupfish, a small bluish, creature that has evolved to survive in the hot saline conditions. About 20 miles from Badwater, at Furnace Creek Inn and Resort (760 786 2345), there are three options for over-nighting: the recentlyrenovated up-scale inn, the family orientated ranch situated around a 16-hole golf course or the campground nearby something for every price class. organize your next 24 hours, and make any necessary reservations. Consider a moonlight horse ride, a hayride or a free show at the visitor center that explains various historical and geological aspects of the park. Death Valley's location far from city lights makes it an ideal location for the street-side astronomers who are often set up outside the visitor center. So much to do, so little time! morning hike though one of the many nearby canyons, followed by a hearty breakfast. You may prefer a round of golf at the lowest golf course in the world, a quick dip in the pool fed by natural warm springs or a leisurely game of tennis. Before long it will be time to have lunch and hit the road again. history and showcase of artifacts from the past, such as antique stagecoaches, mining tools and a railroad steam locomotive from the Death Valley Railroad. 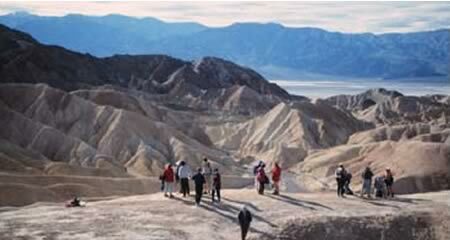 Head southeast on Route 190 to Zabriskie Point for a panorama of undulating gullies and mud hills. The flat salt plains on the valley floor are visible in the distance. It will take about 30 minutes to drive up, look around and return. Just beyond Zabriskie Point, take the 5-mile, one-way loop through 20 Mule Canyon. The road is named for the teams of mules that once pulled wagons loaded with borax from mines on the valley floor. Dormant shafts give evidence of the mining activity that once abounded in the area. eastern border of Death Valley National Park. Here is the best overall view of southern half of the Park. 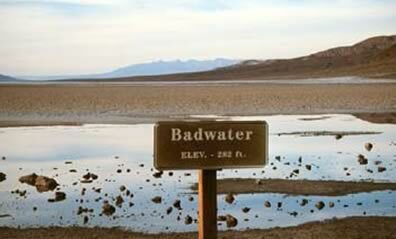 Badwater, over one vertical mile (5,700 feet) below is visible. On a clear day, Mt.Whitney, the highest peak in the lower 48 states is also visible 75 miles due west. Continue east on Route 190 toward Death Valley Junction, a ghost town setting right out of a 1950s western. 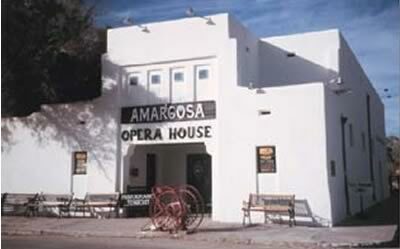 However, this ghost town comes alive on Monday and Saturday evenings during the winter when the Amargosa Opera House offers visitors a musical performance by renowned ballet star Marta Becket. It is another one of those incredible desert incongruities. In 1967, Marta Becket, a classical dancer, stopped here to fix a flat tire and left with a dream. She leased the rundown theater for $45 a month, renamed it the Amargosa Opera House, and with her husband began fixing it up. Her first show drew 12 customers; on some evenings, that first year, nobody at all came. So Becket painted an audience on the walls and kept on performing. Try to time your visit with a performance (reservations are necessary. 760 852 4441). From here, head back toward Route 160, Pahrump and Las Vegas filled with a new vision of Death Valley and deserts in general. Death Valley National Park, established in 1994, comprises 3,000 square miles (over 3.3 million acres) of widely differing topography, and is now the largest national park in the coterminous United States. crossing in the winter of 1849. Indians knew this area as Tomesha, "Ground Afire." The Valley generally receives about 1.8 inches of rainfall per year, but weather conditions vary greatly throughout the region, primarily with elevation. Creek in 1913 when the temperature peaked at 134°F. On a normal summer day, when air temperature is a brisk 120°, ground temperature on the valley floor can be 200 °F. The months between October and March are uniformly cool and pleasant, with highs ranging between 68 and 80 degrees. Death Valley is not a name anyone in the tourist business would pick; but some tourists leave Death Valley disappointed if they have not experienced temperatures of 120° or higher! You will arrive back in Las Vegas with your appetite whetted for more desert adventures. Start planning your next trip into Death Valley; there is much more to see and do: visit Scotty's Castle, scramble down Ubehebe Crater, drive through Hell's Gate and more. 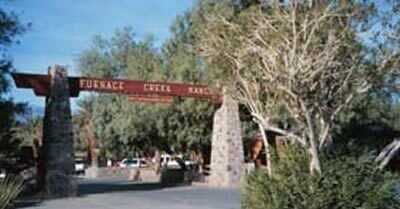 Or, make a day of it in Nevada's Red Rock Canyon or the Valley of Fire State Park. Never again will you conjure up a mental picture of a vast wasteland with blowing sand and bones whitening in the unmerciful sun when you hear the word desert.